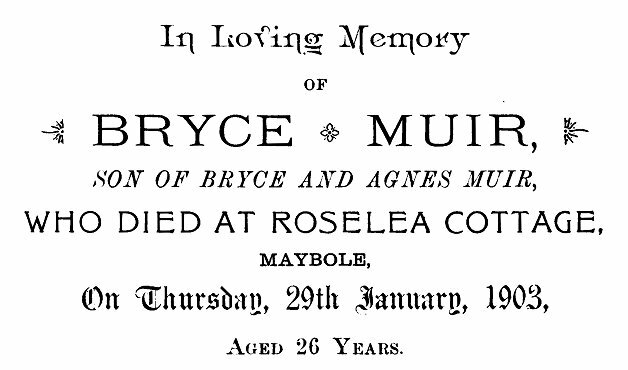 The memorial card above was contributed by Cathy Hines who said that "...So far I've discovered that my family is related to the McDerments, McClure, Humphreys, McKails, Frazers, Bryans, Bruces, Finnays and Thorburn all from around the Maybole area. My grandmother, Jeanie Whyte was born in Maybole in 1899. She and her family emigrated to Canada around 1912 and her father, Charles James Whyte opened two Scottish grocer/bakery shops in Montreal. 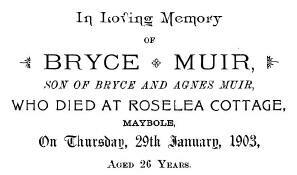 I think that the Bryce Muir mentioned is somehow related to my family..."